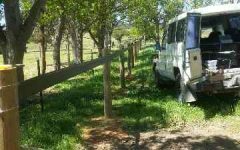 This article is all about minimising horse injuries with fencing. 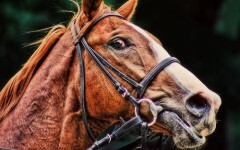 Further to our previous blogs on horse behaviour and injury risk in this blog we will be considering the tendency for horses to fight ferociously when entangled or startled. 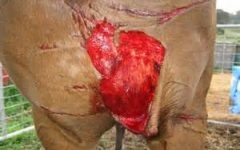 Be aware that this post contains graphic images of horses caught in dodgy fencing. Posting images like these will invite criticism. So be it. 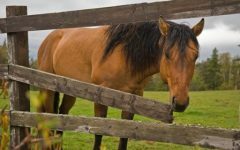 I don’t think I should apologise to people who keep horses in fencing that is designed for other livestock or fencing that is designed to be temporary. For others who “do the right thing” I do apologise if any images are upsetting. It is however my job to advise on what safe practice is and be an advocate for animal welfare. 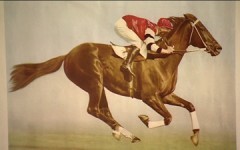 More than other livestock, as part of the horses flight mechanism, horses become fighters. Once caught up in an unsafe fence they will not become calm until they have exhausted their energy fighting. Long legs will pump and drive until they are free or further entangled. 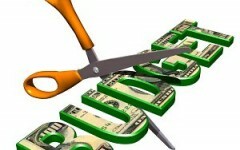 Much damage can happen in the process quite out of the sight of owners and help. How can anyone think this is safe? The fence is so flimsy next to this majestic animal. 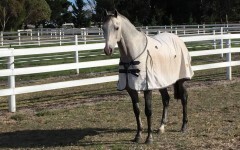 This will end with the horse destroying the fence and the fence cutting him to bits. 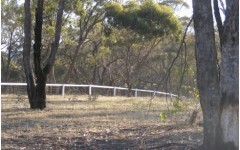 To be successful at minimising horse injuries we must provide a safe and sturdy fence. 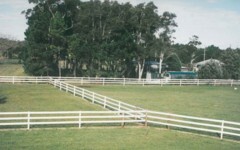 Whenever possible avoid fence types which rely on wire or rope as the only vertical component. 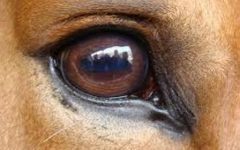 Apart from the visibility problem, these are unlikely to stop a truly determined horse and more sturdy materials will be required. 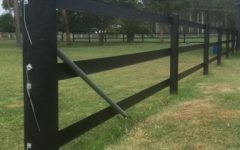 Consider the golden rule of horse fencing – make it sturdy enough to survive the impact (and discourage a second attempt) and yet have enough give or flex in it to minimise the risk of injury. Avoid rails or wires that can cause abrasions after entrapment. 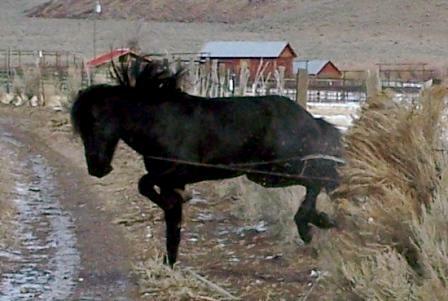 Standard fencing wire use for cattle and other livestock cuts horses deeply. 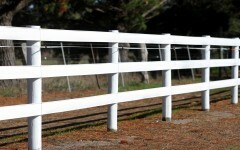 Be aware of any rough or sharp edges on other fencing materials. 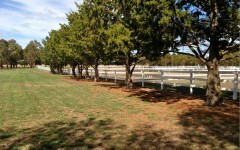 Make sure fence posts are sturdy, braced well and installed properly. Many a fence is undermined over time by wobbly posts which make the rails themselves unsafe. Make sure any “strained fences” are kept taught. 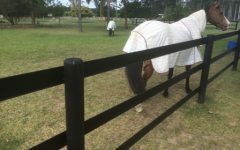 If using wire, polymer coated wire or other strained horse fencing make sure it does not become loose so that each rail forms a sturdy barrier in conjunction with the other rails. Don’t let your animals get caught between the rails as shown in the photos below as this is when the fight really begins. Consider “training them of the fence”. 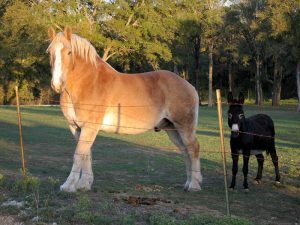 Some electrification, in addition to a sturdy fence, can help teach most horses to stay clear of the fence itself. Get advice. 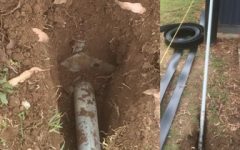 Don’t rely on what your local contractor wants to install. Talk to people at you club or research online. We are amongst others here to help. If we do things correctly in the first place the sort of scenes shown below can be avoided. 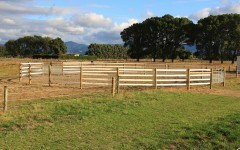 Plan your fence well, make sure it is suitable for horses and keep it well maintained. 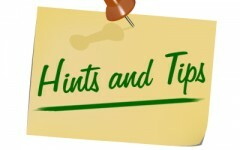 Follow these steps and you might just be successful at minimising horse injuries. This fence is just not sturdy enough. 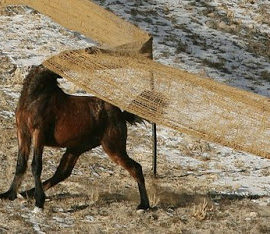 Horse will test flimsy fences, lets hope this ended well. This will have a terrible end. The horse is already caught and the barbed wire is already cutting him up. But he won’t stop until he can’t fight any longer. The openings are too big in this mesh, also it has proven not sturdy enough opening up the space between to top wire and mesh. An accident waiting to happen.